The AV-30 Light Assault VTOL, more commonly known as the Kestrel, is a combat vehicle used by the United Nations Space Command, manufactured by Misriah Armory. The Kestrel hovers above the ground by three ducted air fans rather than using traditional wheels or treads. These fans allow the Kestrel to easily navigate narrow spaces and partake in acrobatic aerial maneuvers. The standard production model of the Kestrel is armed with a set of twin-linked GAU-10/A heavy autocannons. Some experimental models are also armed with a pair of M302 rocket pods. The Office of Naval Intelligence invested heavily in weapons prototyping, although most new designs never make it past the theoretical/modeling stage. Every once in a while a new weapon system proves to have the perfect mix of lethality and survivability, and the Kestrel is a perfect example of human ingenuity pushing the war effort in the right direction. Starting with several competing design philosophies encompassing various shapes, armament combinations, and turbine layouts, ONI skunkworks engineers eventually settled on a final design that was handed off to Misriah Armory for serial production. In July 2557 AV-30 Kestrels were used by headhunters during the Battle of Installation 03 and Battle of New Phoenix. During the defense of Onyx of October 2558, UNSC forces used Kestrels against Created forces. The Kestrel was originally an aircraft that was cut from Halo: Combat Evolved at an early stage of the game's development, though the name remained in the game's code. Various pieces of concept art for the craft are shown on the Halo 2 Collector's Edition disc. Its design inspired the canonical version introduced in Halo: Spartan Strike. MEGA Bloks' Light Assault VTOL. MEGA Brands released toy building sets of the UNSC siege bike and the so-called Light Assault VTOL, later identified as the Kestrel. In a Q&A edition of the Halo Bulletin, Frank O'Connor confirmed the vehicles exist in canon, though not necessarily in the manner depicted by MEGA Bloks. Background information seemingly at odds with the canonical depictions was provided for the toys. The Light Assault VTOL is said to be an aircraft designed for used in confined environments to provide ground and air-to-air support. Developed by the Office of Naval Intelligence's REAP-X division as part of a line of exotic attack vehicles, the VTOL is armed with a pair of twin-linked GAU-10/A HAC autocannons and a single M302 Class-1 Guided Missile Launch System. In contrast, the canonical version is represented as a ground combat vehicle armed only with a pair of autocannons; indeed, it performs similarly to the Brute Chopper but maneuvers much like the Type-32 Ghost. Following the UNSC tradition of naming vehicles after animals the AV-30 is named after the Kestrel, a group of falcons capable of hovering in still air. The Kestrel resembles the Manta from Unreal Tournament 2K4 and UT3. Concept art of the cut Kestrel in Halo 2. Cutout of the original cut Kestrel model. Concept art for the Mega Contrux version of the Kestrel. A blueprint of the MEGA Kestrel. 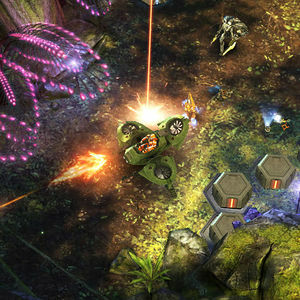 A Kestrel engaging the Covenant and Prometheans. A Kestrel versus a Ghost. A Kestrel destroying a wall.